Start by taking special steps to prevent unnecessary tangling. 1. Before stepping into the shower make sure hair is completely detangled while hair is right side up. You can use your fingers, a wide tooth comb or similar hair friendly tool to remove all snarls, snags or tangles while hair is 100% dry. 2. Once the top of the hair is detangle, bend over at the waist and detangle upside down. 3. Apply pre-wash jojoba oil, conditioning treatment or similar to the ends and other damaged areas. 4. Carefully twist pre-treated hair into a bun. Use a large claw clip to hold in place and allow conditioner to soak completely into the strands. 1. Bend over at the waist and remove the claw clip. 2. 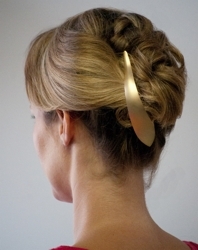 Finger comb carefully to remove the bun and remove any newly formed tangles or snags. 3. Get hair very wet with lukewarm water. Once hair is soaked, bend over at the waist and direct all hair over the top of the head. 4. Cleanse with desired products for hair type, texture and condition. Opt for either a Diluted Shampoo formula (DS), Conditioner Only formula (CO), Water Only (WO), Low Poo (LoPoo) or a combination of options. Some people like to start by getting hair very wet with lukewarm water and apply a rinse out conditioner (CO) before bending over at the waist. The idea behind this process is that the goal of cleansing hair upside down if to protect the top layers. If a rinse out conditioner is first applied, this would add a level of protection to the top hair. 5. After applying the rinse out conditioner, rinse it out of the hair. At that point, bend over at the waist and apply a Diluted Shampoo, LoPoo formula or full strength shampoo. Pat desired cleansing formula over the hair allowing it to seep through the layers from the underneath to the top. 6. Rinse out cleansing formula completely while still bent over. 7. When cleansing formula is completely rinsed out of the hair use fingers to squeeze out excess water. 8. Liberally apply a moisturizing rinse out conditioner or a deep conditioning treatment to the hair while still bent over. Once the conditioner is applied, flip hair back up and over the head. Carefully detangle while still in the shower. Use fingers or a wide tooth comb. Work from the ends up to the roots. Work slowly and carefully to prevent pulling strands or adding unnecessary tangles. 9. Once hair is competely detangled allow conditioner to completely soak into the strands. 10. Rinse well and then finish with a cool/cold water rinse. This closes the cuticle, add shine and seals the conditioning agents into all the layers of the hair. 1. After the final cool/cold rinse gently squeeze water from hair starting at the ends and working up to the roots. 2. Towel blot hair to remove excess water. 3. Apply a leave-in conditioning cocktail including a leave-in conditioner, defrisant and any mousse, gel or styling cream. 4. After applying your leave-in cocktail plop hair for 30 minutes up to several hours, depending on your goals. There are a lot of options for styling hair. Since the goal is to prevent damage to the top layer of the hair, it’s best to allow hair to air dry since hot blow dryers, finger diffusers or similar may cause heat damage to newly conditioned strands. When possible, finger pick damp tresses. Wrap strands into a loose bun for easy air drying. If you prefer, you may braid hair to encourage natural waves and texture to form. If you prefer, you can roll hair into rag rollers or large hair friendly rollers. If air drying is not an option, sit under a more hair-friendly hood or bonnet style dryer set on a low speed with a low heat setting. Keep in mind that this technique may not work for everyone. It would be especially problematic for hair with extensions applied, some types of textured strands and hair which is not long enough to flip over. For best results experiment with all the different steps and options to develop your own hair friendly, hair protective cleansing system. Ultimately you may decide cleansing hair upside down does not warrant all the time and trouble. Of course everyone needs to always care for the hair in the best method for them, taking into consideration time, budget and ultimate hair goals. Have you tried cleansing your hair upside down? If so, I would love to hear your own secret tips and tricks. Do you find it worthwhile or the results not worthy the time and effort invested? This entry was posted on Friday, March 11th, 2011 at 10:38 pm	and is filed under alternative treatments, Beauty Beat, Curling Hair, Curly Hair, Curly Hair Men, Curly Hair Styles, Frizzy Hair, Grooming, Hair, Hair Recipes, Hair Styling Tools, Hairstyles, Hairstyling Tips, Long Hair, Men's Grooming, Naturally Curly, Shampoo Treatments, Treatments, Wavy Hair, Women's Hairstyles. You can follow any responses to this entry through the RSS 2.0 feed. Both comments and pings are currently closed.